Major flooding in the spring of 2013 devastated Southern Alberta, and currently it’s estimated that 2,700 Albertans remain out of their homes. As part of its response, the Alberta government has introduced numerous measures to try to prevent future flood damage from occurring to homes and businesses. The floods have so far caused $5 billion in property damage and counting, and it’s projected that insurance claims could total nearly $3.75 billion. While it is impossible to build a flood-proof home in Alberta (or anywhere else, for that matter), there are measures you can take to (a) prevent floodwaters from penetrating the interior or your home, (b) minimize damage if they do, and (c) facilitate the efficient disposal of flood-damaged materials. Combined, these are known as flood mitigation techniques, and the Alberta government is requiring that all rebuilt or repaired homes within the province’s high-risk flood zones meet minimum flood mitigation guidelines. According to the provincial government’s new flood mitigation requirements, homeowners rebuilding or repairing homes in high-risk areas must install moisture-resistant flooring. As custom home builders in Calgary and area, Fine Line Homes is able offer a wide variety of functional and stylish moisture-resistant flooring options. If you are making repairs to your current home, or if you are adding flood mitigation measures to a new home, you must ensure that you have all the necessary permits, and that all measures conform to government safety codes and standards. All flood mitigation measures are subject to inspection by municipal authorities before they will be approved. 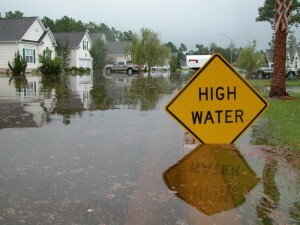 Keep in mind that the more flood mitigation measures you have in place, the lower your home insurance premiums will be. Financing for flood mitigation is available to homeowners forced to rebuild their houses through the Disaster Recovery Program. You can apply online, or request a paper application by calling 1-888-671-1111. In exceptional circumstances, you may also be able to bill repairs directly to the Disaster Recovery Program if you do not have the funds available to finance them yourself. Fine Line Homes is the premier custom builder of eco-friendly homes in Calgary, Okotoks, and surrounding areas of southern Alberta. If flood damage has forced you to have to rebuild or repair your house and you’re interested in optimizing your flood mitigation modifications with features with money- and energy-saving abilities, we will work closely with you to make your vision a reality. We have a wide range of pre-designed floor plans to simplify your custom building experience, or you can design your own with the help and input of our world-class architectural and engineering team. If you’d like to learn more, please contact a Fine Line Homes representative.